Pistachio nuts Pistachios are one of the oldest flowering nut trees. Flourishing in hot climates, pistachios spread from the Middle East to the Spanish Mediterranean. 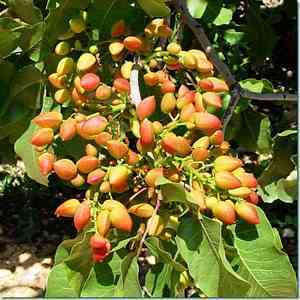 Pistachios are one of the oldest flowering nut trees. Recent archeological evidence suggests that the nuts were being used for food as early as 7,000 B.C. Flourishing in hot climates, pistachios spread from the Middle East to the Mediterranean, quickly becoming a treasured delicacy among royalty, travelers and common folk alike. The pistachio’s high nutritional value and long storage life also made it an indispensable travel item among early explorers and traders. Along with almonds, pistachios were frequently carried by travelers across the ancient Silk Road that connected China with the West. 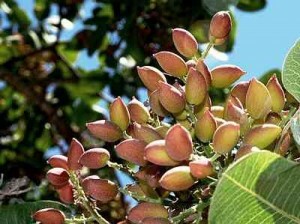 The pistachio is a broad, bushy, tree which grows slowly to a height and spread of 25 to 30 feet (7 to 9 m), with one or several trunks. It is deciduous (drops its leaves each year) and dioecious (comes in separate sexes with the male trees bearing pollen and the female trees bearing the nuts). Both male and female trees must be present for fruit to set, or a branch from a male tree may be grafted on a female tree. Like many other nut trees, the pistachio is alternate bearing – producing a heavy crop one year and a lighter crop the next. Pistachios mature rather slowly, reaching significant production seven to ten years after planting. Peak production is reached at about 20 years. 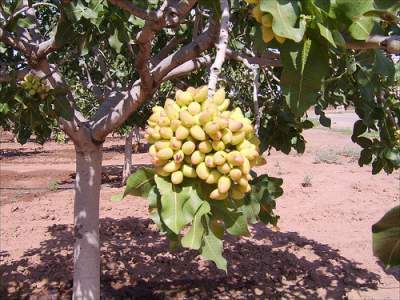 Under favourable conditions pistachio trees live and produce for centuries. Pistachio trees are very tolerant of drought, frost, heat, and saline soil. They need a sunny position and well-drained soil and do best with deep, infrequent watering. Pistachio trees do poorly in conditions of high humidity, and are susceptible to root rot if they get too much water and the soil is not sufficiently free draining. Since pistachios grow slowly, they do not require large quantities of nitrogen fertilizer. A spring feeding of a complete, balanced fertilizer should be adequate. Pruning can be important to commercial growers in order to shape the trees for mechanical harvesting, but less so for the home orchardist. After initial training, little pruning is needed except to remove interfering branches. 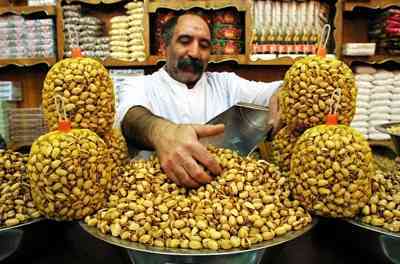 Pistachio nuts grow in grape-like clusters and are encased in an outer skin, or hull. 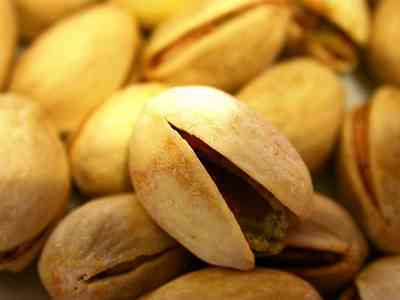 When pistachios ripen, the hull turns rosy and the shell within splits naturally. The nuts are harvested when the husk or hull covering the shell becomes fairly loose, usually in late August to early September. Pistachios can be shaken, knocked or handpicked from the tree. 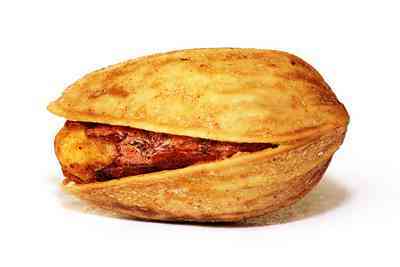 A single shaking will bring down the bulk of the matured nuts, which can be caught on a tarp or canvas. 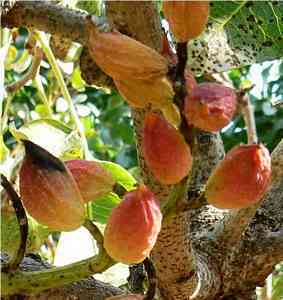 A fully mature tree may produce as much as 50 pounds of dry, hulled nuts. Once pistachios are harvested, the hulls should be removed within a short period of time – no more than 24 hours – to avoid shell staining. (The hull traps moisture that stains the shell if left for a long period of time.) 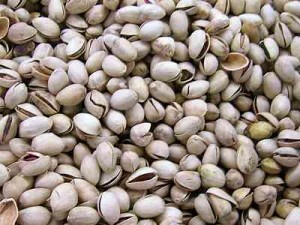 Hulls can be removed by gently rubbing the pistachios together between two towels or in a plastic bag. To enhance splitting, the hulled nuts may then be dipped into water to moisten the shell and spread out in the sun to dry. helled pistachios are often utilized in ice cream, confections and bakery goods or added to dressings, casseroles, salads and other dishes. Spread nuts on a cookie sheet in a preheated 120° C (250° F) oven and roast 1-1/2 to 1-3/4 hours, depending upon taste preference. Stir every 30 minutes. Stored in plastic bags pistachios will last for at least 4 to 6 weeks in the refrigerator. Frozen they will last for months. To salt the nuts before roasting, dissolve 2 to 3 ounces of salt in 4 ounces of water. Pour this salt solution into a deep saucepan over high heat. Add about 8 to 10 cups of pistachios and stir until all water has evaporated and the salt is deposited on the nuts. Try adding your favourite spices with the salt, giving them your own personal touch. They are a natural and healthy snack that is very low in saturated fat, high in dietary fibres, and a great source of protein. 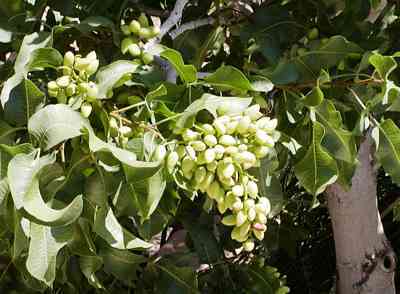 Pistachios are one of the oldest flowering nut trees. Flourishing in hot climates, pistachios spread from the Middle East to the Spanish Mediterranean.